Try not to laugh or roll your eyes too hard as you read what Big Legend is about: Bigfoot. Yes, it's true, writer/director Justin Lee's new movie is about Bigfoot but he also seems to be taking a new approach to the legend because this trailer features some serous thriller vibes. Kevin Makely stars Tyler, an ex-soldier who ventures into the wilderness of the Pacific Northwest in search of his fiance who disappeared in the woods. He teams up with a local hunter (Todd A. Robinson) and the pair find themselves tracking more than they bargained for. Along with Makely and Robinson, the movie also stars Amanda Wyss, Adrienne Barbeau and Lance Henriksen. 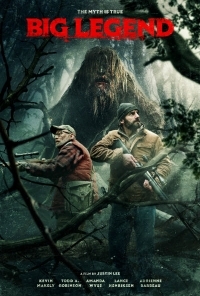 I'm generally skeptical when it comes to movies about supernatural creatures; they then to be played for laughs or worse, they're so intensely overdramatic that they feel like comedies but the trailer for Lee's movie actually suggests Big Legend is effectively going for the "horror in the woods you can't see" approach. Except at one point we do see it. I'm hopeful that Bigfoot doesn't make too many appearances. Big Legend will be available on VOD and Digital HD July 3.